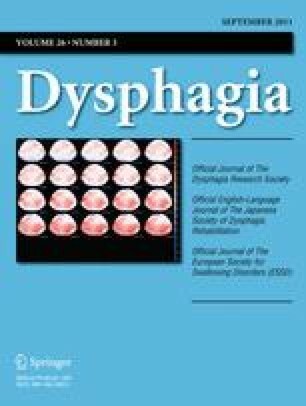 This study aimed to analyze quantitatively videofluoroscopic (VF) images of patients with Parkinson’s disease (PD), to evaluate if the predicted factors of the oral phase of swallowing deteriorated with PD progression, and to demonstrate a relationship between the abnormal movements of the tongue and food transportation. Thirty PD patients were recruited and divided into mild/moderate (Hoehn & Yahr stages II and III) and advanced (stages IV and V) groups. They underwent measurement of tongue strength and VF using 5 ml of barium gelatin jelly as a test food. We measured the speed of bolus movement and the range of tongue and mandible movements during oropharyngeal transit time. The maximum tongue pressure of the mild/moderate group was significantly larger than that of advanced group (p = 0.047). The oropharyngeal transit time of the mild/moderate group was significantly shorter than that of the advanced group (p = 0.045). There was a significant negative correlation between the speed of tongue movement and the oropharyngeal transit time (p = 0.003, R = −0.527). Prolonged mealtimes and the ejection of insufficiently masticated food from the oral cavity into oropharynx were associated with PD progression. These results indicate the importance of the oral phase of swallowing in PD patients. This study was supported by the Clinical Research Foundation in Japan in 2006.